Youngest sisters Kitty and Lydia are too busy with their CrossFit workouts and Paleo diets to get jobs. Mary, the middle sister, is earning her third online master’s degree and barely leaves her room, except for those mysterious Tuesday-night outings she won’t discuss. And Mrs. Bennet has one thing on her mind: how to marry off her daughters, especially as Jane’s fortieth birthday fast approaches. Enter Chip Bingley, a handsome new-in-town doctor who recently appeared on the juggernaut reality TV dating show Eligible. At a Fourth of July barbecue, Chip takes an immediate interest in Jane, but Chip’s friend neurosurgeon Fitzwilliam Darcy reveals himself to Liz to be much less charming. . . . And yet, first impressions can be deceiving. Wonderfully tender and hilariously funny, Eligible both honors and updates Austen’s beloved tale. 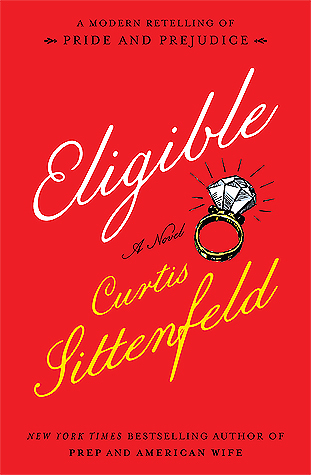 Tackling gender, class, courtship, and family, Sittenfeld reaffirms herself as one of the most dazzling authors writing today. 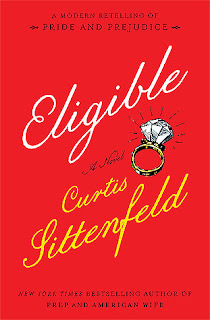 I was very excited to read Eligible because I love anything Pride & Prejudice related. Knowing that this is a retelling, one that is anticipated by many of my reader friends, had me pick it up as soon as I received it in the mail. I have to say that I was hooked immediately, however, this is a 500+ page book... and halfway through the book... the momentum seemed to have fizzled? so while I truly loved the first half of the book, the second half somewhat disappointed. What I liked about Eligible is that the author tried to make this story as much hers as it is Jane Austen's. I have abandoned many P&P retellings because it seemed just that... the story being retold.. with not much personal input from the author. However, Curtis was able to do that. For one, Liz and Jane are both 38 and 40 years old. Many times I would try to remember which part of this plot it is in relation to the original, which showed me how the author owned this retelling. Unfortunately halfway through the novel... I felt I was back to reading a parody of P&P... I felt (personally) that the author lost sight and tried to make it as unique as possible to the point that some scenes felt contrived? or made to be too different from the original to the point that the decisions and paths made didn't make much sense.. however the author has to follow the direction of the original work. A very thin space is between being too much like a P&P retelling, and being too different to not make it look like one. Some decisions some characters made were not in character but they had to be made to stick to the storyline. It was a tad disappointing. I liked Liz however she was very easily pushed around by her family. She paid for things, listened to her annoying mother complain even though it is her mother's fault they are in that exact situation.. let her younger sisters talk crap about her to her face..... that was very grating on my nerves. However I got she was trying to be the mature one here. Lastly, the romance... I wasn't a fan of? it wasn't developed well... seemed out of the blue how they both liked each other... I was waiting for that signature P&P tension between Liz and Darcy but I didn't see it. I know I had complaints about the book.. but I truly did enjoy it. If I had to rate it, I would give the first half 4 stars while the second half 2 stars. I would recommend it to fans of P&P retellings if any that i've said doesn't bother you too much.. I know it didn't bother me all that much since I was able to finish the book by the end. Lovely! I'm glad you were able to enjoy this one. Even thought it doesn't seem like something I'd read, it still sounds good. Nice review!